In 2002, ADOT quit using colored shields for the Loop routes. This was done because of fading problems, and because they were getting too many errors. New shields were supposed to be the standard black-on-white. It doesn't seem to have helped the error problem -- this one went up in May, 2003. 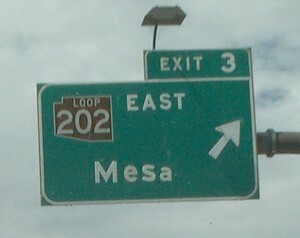 ADOT normally does such a good job with signs. It's a surprise to see an interchange this poorly signed. What's worse, this is at the west exit from the airport, so a lot of people unfamiliar with the area use this interchange. 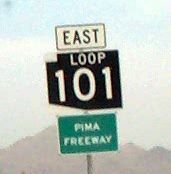 There used to be a sign along the right side of the road indicating that I-10 and I-17 traffic should use the left lane. 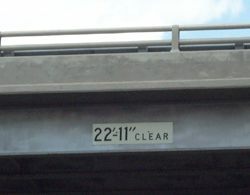 There was also a sign on the empty brackets for I-10 East. While 24th Street (just behind us in this picture) was being realigned, the roadside sign was removed and the overhead sign was knocked down. 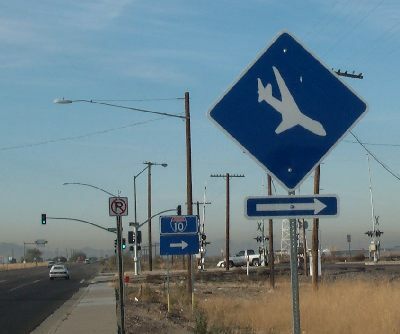 The project has been complete for months, but the signs were never put back up. 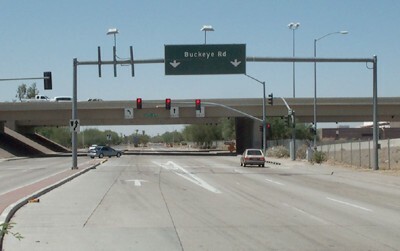 Even before that, the Buckeye Rd sign's lane arrows were not properly aligned over the lanes. This sign is the only clue as to the turn, and many drivers see it too late. They either turn at the last second, or have to go past it and make a U turn. I work at the office just past this interchange, and I see a lot of cars making U turns. Another problem is the lane striping. 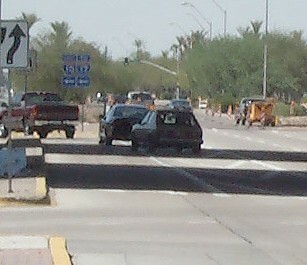 The right-hand left turn lane has been lined out, but the stripes can be hard to see, so some people try to use it. Problem is, the island on the opposite side of the intersection sticks out too far for two lanes to turn left. The cars have to squeeze past each other. Tsk. I've written to the Freeway Action Line about this interchange, but never got a response. Fading due to sun exposure is a big problem here. 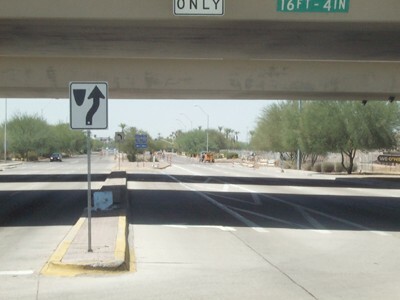 ADOT has a test facility at I-17 and Camelback Rd in Phoenix. 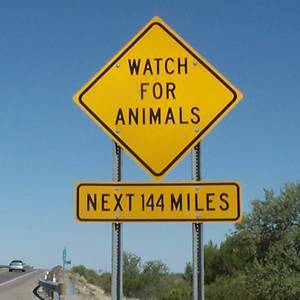 144 miles? That's a rather precise number, which is reconfirmed 4 miles later. 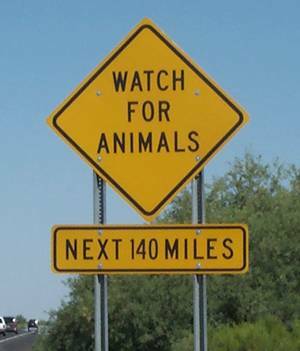 I can't figure out what happens in 144 miles, though. This is on US 93 just north of the junction with AZ 89. 144 miles from this point on US 93 is roughly the Chloride turnoff (old AZ 62).